Decoybetty: Gluten Free Cookies...The Buckeye edition. Gluten Free Cookies...The Buckeye edition. As part of my life list, I am going to try 100 new recipes. This is the first! So, do you read Smitten Kitchen? 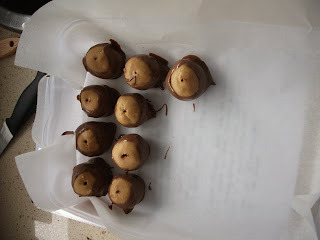 It is FILLED with drool worthy recipes like this one: Buckeyes. 1 cup graham cracker crumbs - of course being allergic to gluten, I used gluten free tea biscuits found at Coles. 12 ounces dark chocolate (60 to 72%), coarsely chopped - I used milk chocolate because I don't like dark...I know. Step 1. Ask Inspector Climate to beat gluten free tea biscuits in a plastic bag with a wooden rolling pin. In a bowl, beat the cream cheese and peanut together with an electric hand mixer - if you are lucky, you could due this in a kitchen aid like device, but I don't have that kind of technology. Add the crumbed biscuits, and beat for a few seconds. Add sugar and butter, mix until combined. Now in a stand up mixer I am sure this would come together and form a ball. 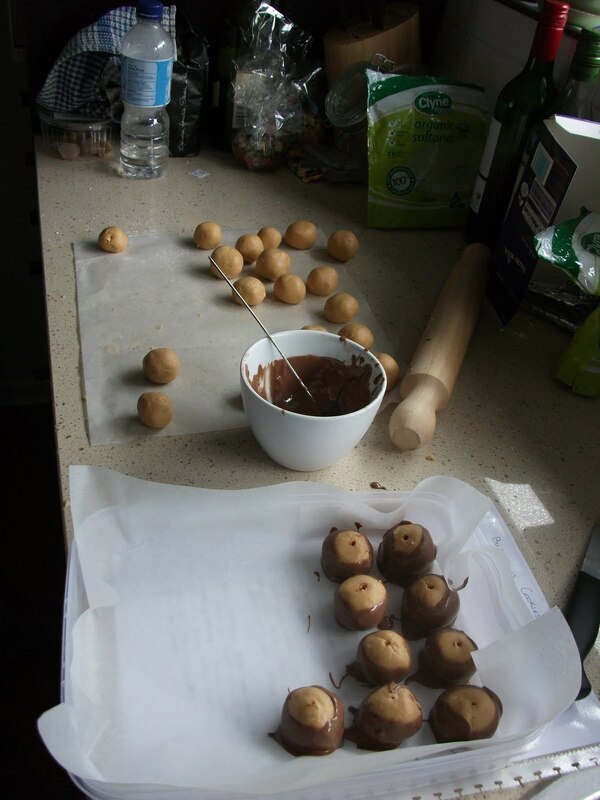 However, using an electric hand mixer I had to get my hands dirty and form it into a ball myself. Now, in hindsight I wish I had put this in the fridge for it to firm up a little before I formed into tablespoon sized balls. But I didn't do that...instead I skipped straight to step two. Step 2. Using a double boiler (or a version of one if you're me and only have one glass bowl which was currently in use - so I used a small pot of simmering water underneath a larger saucepan...eh! Creative cooking) melt the chocolate until smooth. Which is to say they looked liked balls in chocolate skirts. Which is cool. I guess. Part of the problem was that the peanut mixture was really soft and thus the skewers would tear and rip when we dipped it into the chocolate. So we never really got the "eye" like look that Smitten Kitchen did. They are still delicious though. And appearance isn't EVERYTHING? right? RIGHT? We only made half a recipe and we got 36 cookies. Nom nom nom. They are absolutely delicious and the fact that they don't have any flour means that they adapt reallly easily to being gluten free. Win win. Edited to add: oh yeah, refrigerate the cookies....they'll keep for nearly a week in the fridge. Nothing in real life looks the way it does in Smitten Kitchen. Thanks for the comment on my blog, I just popped over and discovered this recipe. It looks fab! I'm your latest follower. It looks like I will have to re-do my shopping list. smitten kitchen is my god. my drool inducing god. also twisted susan, it totally can look that way in real life. and her recipes are way easy to follow imho. ps. now i'm hungry. and i want a peanutbutter chocolate ball of goodness. le sigh. those look awesome! great job. I never have the patience for baking. Twisted Susan - I am sure SOMEONE is capable - but I've never been on for presentation. Kirsty - Yay! Thanks for following. Kyle - Well, I have a life time to do it in :) haha. Pepe Le Pew - Seriously, they are yummy. Rhea - I know she's amazing. the only thing i own (in Australia) is measuring cups and overly expensive cast iron pan. Now why did your turn of phrase "balls in chocolate skirts" make me giggle? It wasn't a juvenile "she said balls!" giggle either...I just thought it was so cute. I've never heard of buckeyes...they sound yummy though. Good luck with the 100 recipies! Thanks for stopping by my blog! Jummy - they are quite delicious. and addictive. Krysten - hah, I would love to! le sigh. Amy - No worries, let me know how the turn out.